Is there any command I can write in the latex file to have "3.2 (II)" displayed automatically in the PDF? the standard commands "\label, \ref" don't give me what I want. Hope this is what you're looking for. 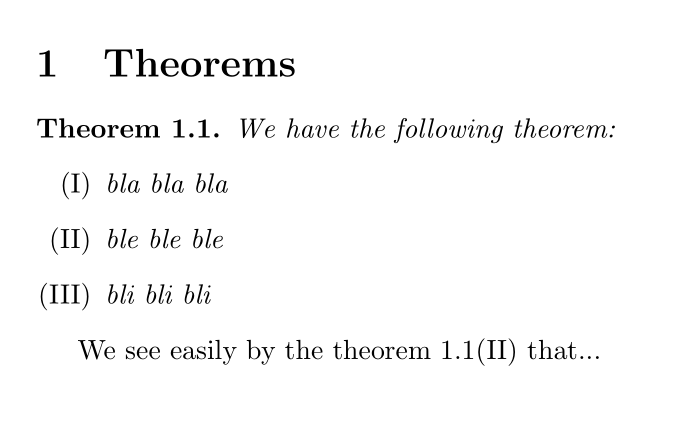 With the help of enumitem package, we can define the reference to an item to be \thethm (\Roman*) so to incorporate the theorem number. 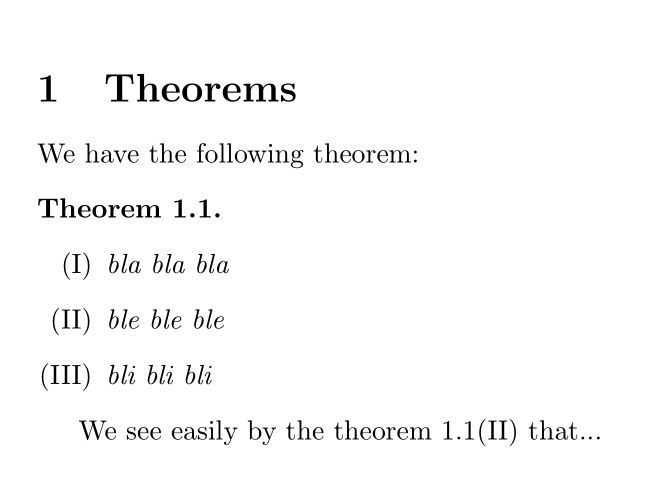 Note that you have to change \thethm to the counter you're using for your theorems. If you need to have the theorem header immediately followed by the list, you can add before=\leavevmode to the options of the enumerate environment. reset the low-level LaTeX paramaters \theenumi, \labelenumi, and \p@enumi suitably to get upright-shape uppercase-Roman numerals, with the theorem number pre-fixed when used in cross-references. Not the answer you're looking for? Browse other questions tagged cross-referencing enumerate theorems or ask your own question. Referring to a label: how to change the name?